Did you ever have a favorite meal that you had to just keep trying different ways? That’s what red beans and rice is for me. I absolutely love this dish! 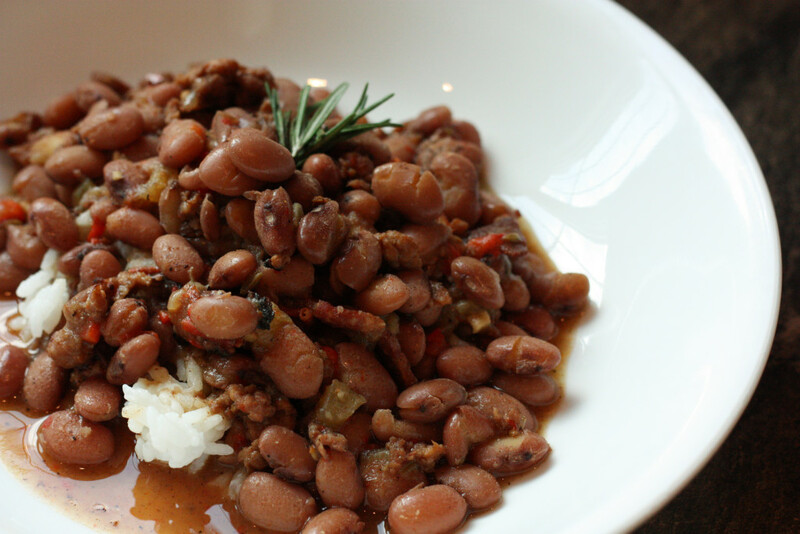 This is a sophisticated red beans and rice recipe compared to my original red beans and rice recipe. This recipe has more vegetables and uses dried beans instead of canned. Dried beans can be tricky to correctly rehydrate. Crunchy beans should be avoided at all costs! Make sure they are cooked long enough. Since today is July 1st, I just had to choose “July Tree” sung by Nina Simone as today’s song. Enjoy! Soak rinsed and sorted beans overnight or for 6-8 hours. Cook sausage in a large frying pan over medium high heat until slightly browned and no longer pink. Scoop sausage onto paper towel lined plate to drain off grease. Set aside. Leaving 1 tablespoon of sausage grease in frying pan, remove the excess. Over medium heat, add chopped celery, onion, red pepper, and garlic. Stir to coat with sausage grease. Cook until slightly tender, about 3 minutes. Stir in cayenne pepper and red pepper flakes. Add cooked sausage back to the frying pan. Stir vegetables and sausage. Crumble bouillon cubes over vegetables and sausage. Pour 6 cups of water over mixture and stir to dissolve bouillon. Cook over medium low heat for 30 minutes. If beans are still hard, cook for another 15-30 minutes. Serve bean and sausage mixture over hot rice.